The idea to write a mini "guidebook" entry on my hometown of Youngstown, Ohio, originated on Instagram. Over the Christmas holidays, while I was home, I posted a photo of the city on my Instagram feed and wrote (just to be cheeky): “when Lonely Planet gets around to writing a guidebook on the Rust Belt, I’ll have a first-row seat.” And then it occurred to me: Why not write my own guide and post it here on my blog? Yeah, I know it doesn’t exactly fit the "Travel & Adventure in Central Europe" part, but Youngstown was largely settled by Poles, Slovaks, Czechs, and Hungarians. It's a little piece of Central Europe in the middle of the United States. Oh yeah, and to be fair to Lonely Planet, while they don't have a guide - per se - on the Rust Belt, they do have quite a few travel articles on "rusty" Midwestern destinations. 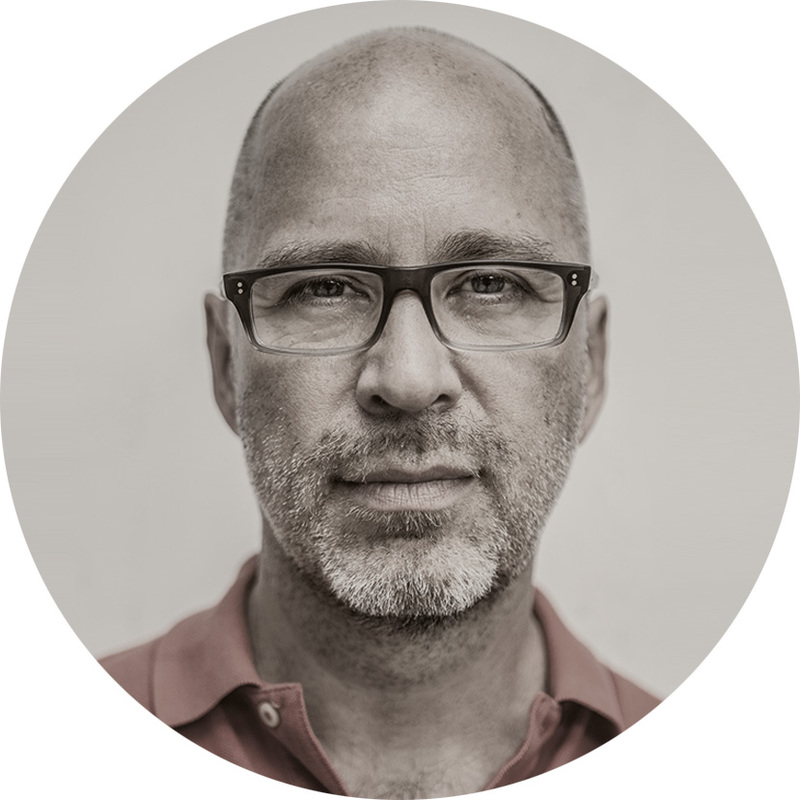 Find a good piece here on Buffalo, New York, and this one on Cincinnati, Ohio, for example. Top Photo: The 'Old Mill' -- Lanterman's Mill -- dates from the 1840s and remains the symbol of Mill Creek Park. This bucolic setting is just a couple of miles from the downtown area. The mill is open to the public and still grinds corn and wheat. Photo by Mark Baker. Posted in On The Road and tagged Christmas, hometown, Ohio, rust, rustbelt, steel, USA, Youngstown. Approaching the downtown area from the north. The city's tallest building, the Metropolitan Tower, stands to the right. Photo by Mark Baker. Signs of regeneration are everywhere to be found. The white building here, the Stambaugh Building, will house a new Hilton Hotel sometime in 2018. Photo by Mark Baker. The iconic "Home Savings & Loan" tower stands at the western end of West Federal St. Though this isn't the city's tallest building, it's arguably the city's favorite. Photo by Mark Baker. While new buildings and businesses open up, downtown Youngstown is still spotty, with lots of vacant lots. Who knows if the local economy can support the expansion, though the potential is definitely there. Photo by Mark Baker. It’s customary to begin a travel article or guidebook entry on a destination with a “Why Go?” paragraph, where the author makes the case that a particular place is worth visiting. With Youngstown, I confess I struggled a bit here. 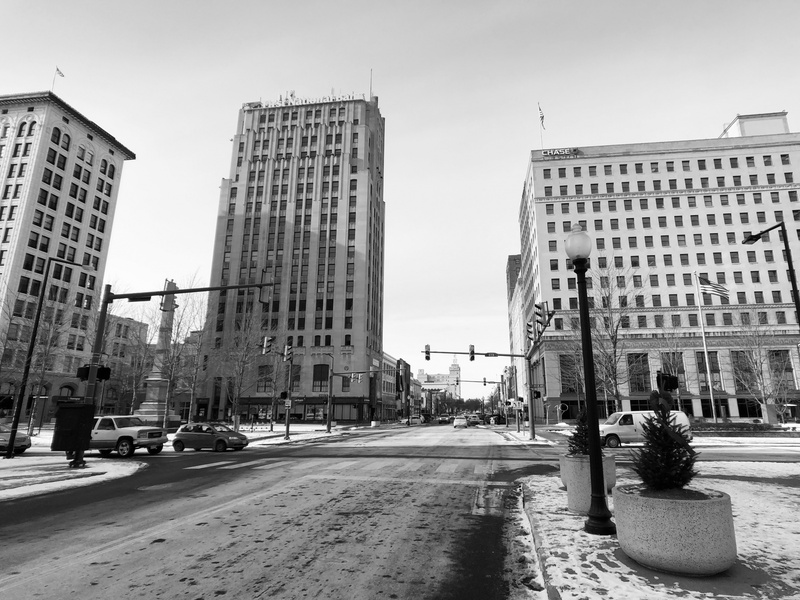 Not that Youngstown isn’t worth visiting – it is – but it’s hard to articulate exactly why. For hipsters (and others looking for authenticity above all else), the aging industrial infrastructure, the gritty downtown, and the surviving remnants of immigrant culture are all the real deal. Nothing has been sugar-coated or lacquered over in irony. 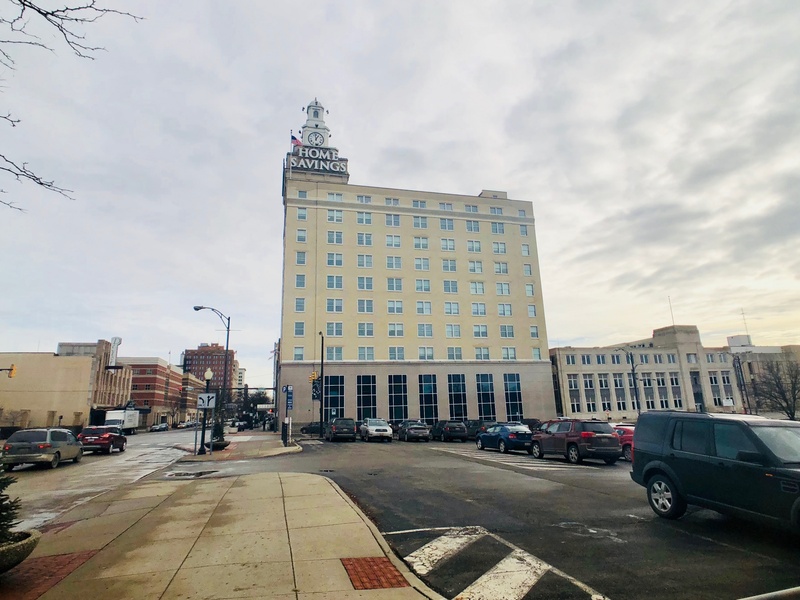 American history buffs will love learning about the city’s past as a labor stronghold and steel-making center, or the old days when Youngstown was in thrall to organized crime. The city, for a time in the 1960s, was even dubbed “Crimetown USA” – there were so many mob hits. As for industrial street cred, hey, perennial U.S. Communist Party presidential candidate Gus Hall got his start in the mills here. The notorious anarchist, Bartolomeo Vanzetti, of Sacco and Vanzetti fame, may even have detonated a bomb in Youngstown in 1917 or thereabouts. For everyone else, there’s always the "Interstate 80" excuse. 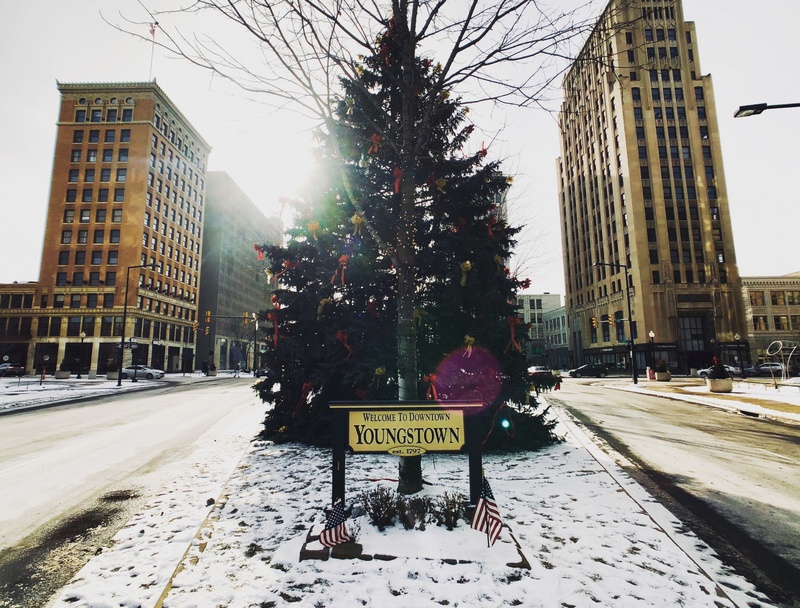 Youngstown lies midway between New York and Chicago, a comfortable day’s drive from both and a popular spot to put in for the night. Instead of quick in-and-out at the local Hampton Inn, why not tie an overnight stay with a tour of the museums and dinner at a local restaurant? Iconic view of the downtown area, at the main intersection of Federal St and Wick Ave. Photo by Mark Baker. The DeYor Performing Arts center in downtown. The relatively plain exterior hides an extravagant interior. The building is home to the Youngstown Symphony Orchestra and has musical and cultural events throughout the year. Photo by Mark Baker. 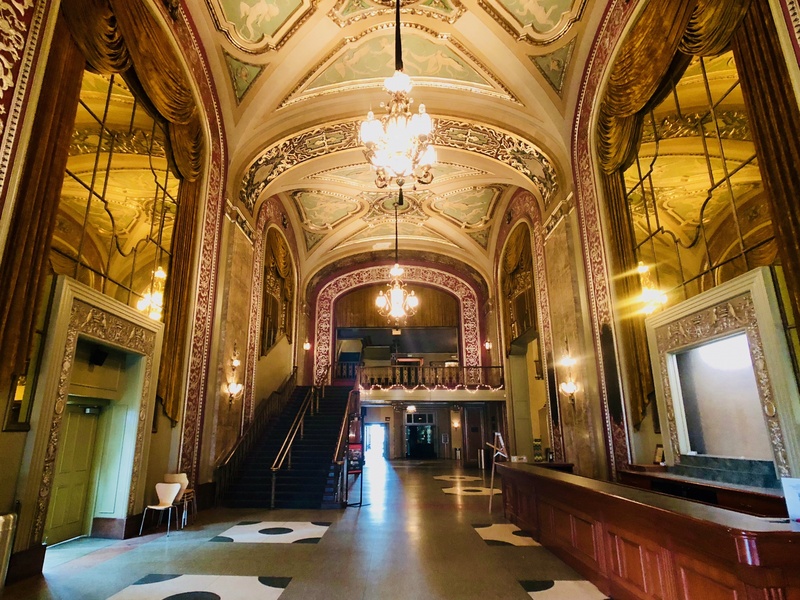 The lavish entryway to the DeYor Performing Arts center in downtown Youngstown. The city is lucky to have such a beautiful building for classical concerts and dance. Photo by Mark Baker. The Tyler History Center is a relatively new attraction downtown. The permanent exhibits highlight mainly Youngstown's 20th-century history from boomtown to bust-town. Photo by Mark Baker. The second part of any travel article would be the “Exploring” section – in other words, what to see and do. As with any other medium-sized American city, though, you’ll need your own wheels to get around. Youngstown has a skeletal bus system, but it’s not really practical for moving from place to place. 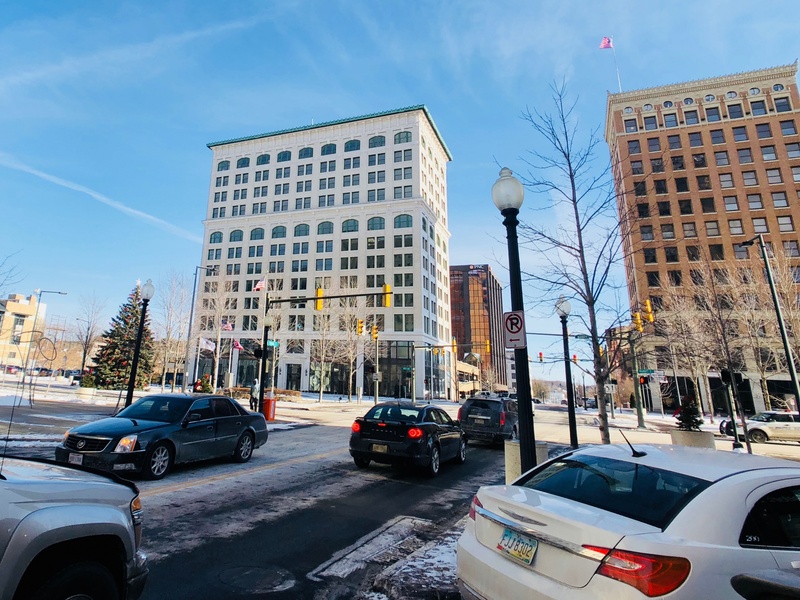 For Youngstown, I'd suggest starting your exploration in the compact central business district, defined by the intersection of Federal St and Wick Ave/Market St. This has been Youngstown’s downtown since the very earliest days, when the city was incorporated in 1848. 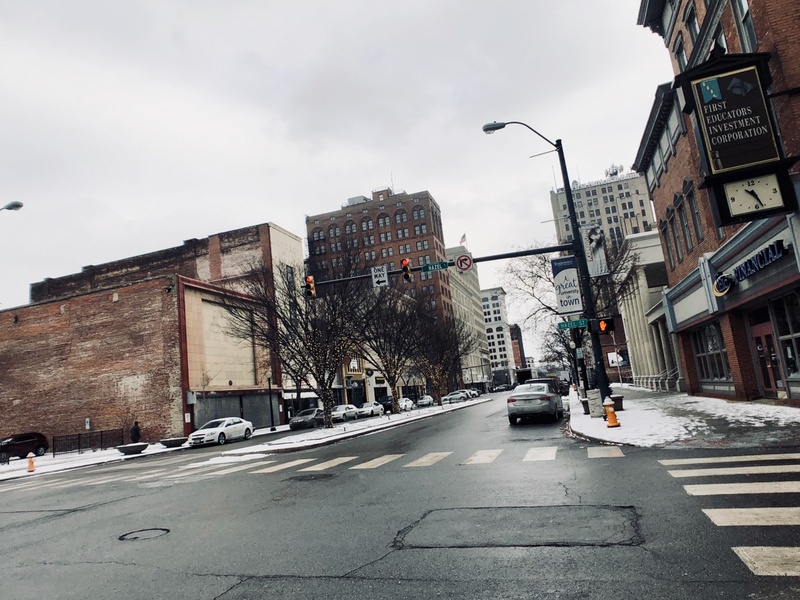 Throughout the 20th century, as Youngstown’s population grew to a high-water mark of around 170,000 in 1930 (the 45th largest city in the U.S. that year) and stayed more or less level into the 1960s, the downtown area thrived. These days, with far fewer people walking around, it feels a shadow of its former self – though the still-intact skyscrapers and lingering whiff of industrial grit in the air impart a kind of living-museum feel of a former “Jazz Age” boomtown frozen in time. To put yourself in the proper mood, you might want to queue up Youngstown native Tiny Bradshaw’s 1951 jazz-blues smash “The Train Kept A-Rollin’” or local band Left End’s 1972 glam-rock classic "Bad Talkin' Lady" (trigger warning: lots of cowbells) on your Spotify playlist. Of course, there’s always Bruce Springsteen’s 1995 tearjerker, “Youngstown,” that captures well the despair the city felt in the 1980s and ‘90s. The past few years, thankfully, have seen a welcome return to the downtown area of pubs, restaurants, and clubs, and these days it’s possible to make a bona fide evening pub crawl along West Federal St. 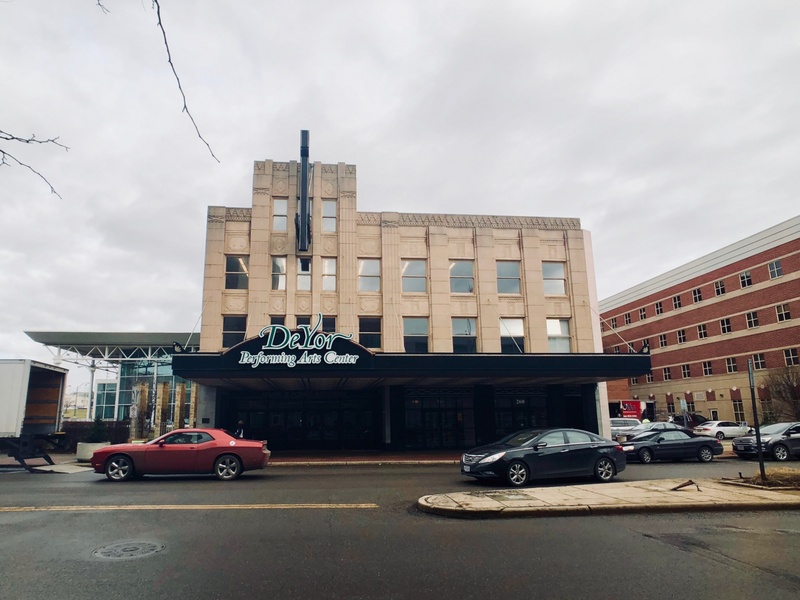 Downtown is also home to the city’s best museums, the DeYor Performing Arts Center (usually referred to as Powers Auditorium), the Covelli Centre, and the campus of Youngstown State University, which is worth a stroll in its own right. The DeYor is home to Youngstown’s still-popular symphony orchestra. The Covelli usually offers more middlebrow fare, like touring aging rockers and truck shows. As for museums, the only true “don’t-miss” is the esteemed Butler Institute of American Art, a block north of downtown, which is often credited as the country’s first museum dedicated solely to American art. The permanent collection is strongest (in my opinion) on pastoral, slice-of-life 19th-century landscapes, though the 20th century and contemporary collections are solid as well. The best-known paintings are considered to be Winslow Homer’s “Snap the Whip” and Edward Hopper’s “Pennsylvania Coal Town,” as well as works by Georgia O’Keeffe and Robert Rauschenberg. Normal Rockwell’s “Lincoln the Railsplitter,” from 1965, is a local favorite. The nearby Arms Family Museum is housed in an impressive Arts & Craft style mansion, the Greystone, from 1905 and is worth the price of admission alone to peek inside. This is the main exhibition site of the local historical society, and the permanent collection here features photos, paintings, clothing, and bric a brac from Youngstown and the surrounding area. 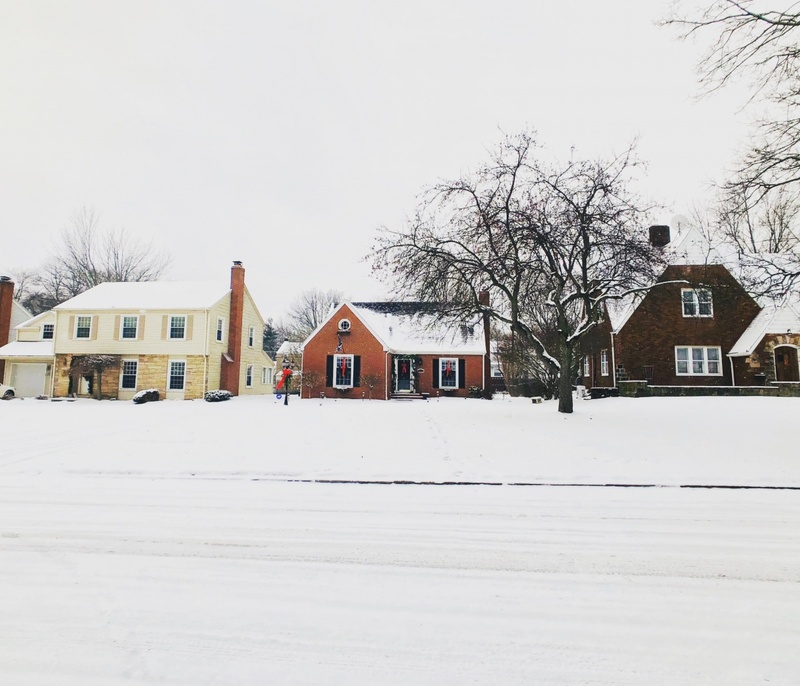 It was here that I first discovered that Youngstown – to serve a thriving immigrant community in the early-20th century – once had its own Slovak-language newspaper: titled appropriately Youngstownské Slovenské noviny (Youngstown Slovak News). After having lived so long in Czech-speaking Prague, I found I could read it fairly easily. 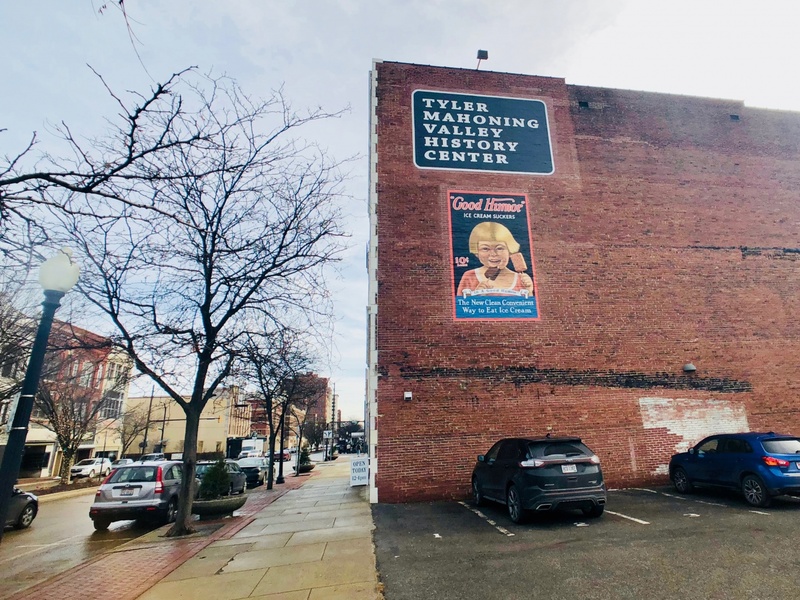 A newer history museum, the Tyler History Center, stands in the immediate downtown area and is aimed more at local visitors, with nostalgic exhibitions featuring old Youngstown-area TV shows and shopping centers. Worthwhile here, though, are the many sound and video exhibitions, including a riveting short on the Youngstown mob, narrated by former local TV news anchor Tom Holden. One of the highlights of the Tyler History Center is the section on Youngstown's defunct but still beloved amusement park, Idora Park. I may have sat behind the wheel of this very car as a kid. Photo by Mark Baker. 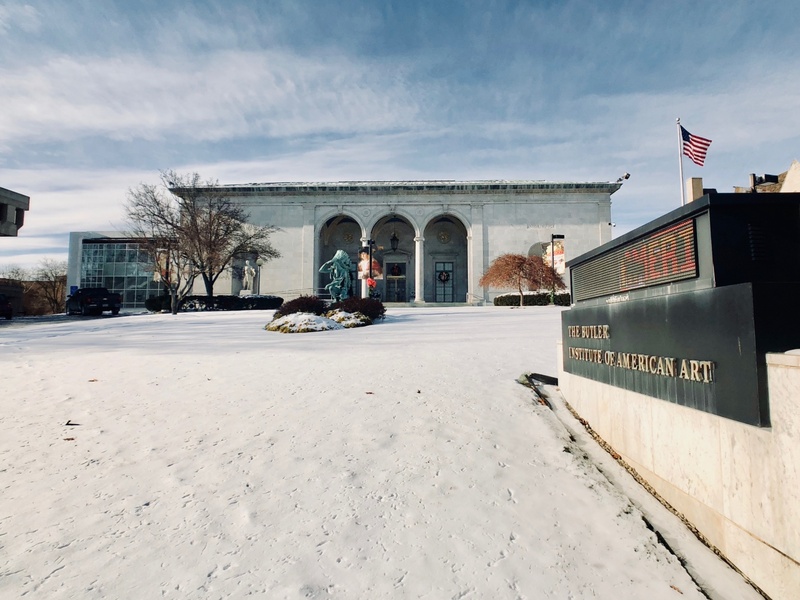 Without doubt, the city's main cultural attraction is the Butler Institute of American Art, which is often credited as the first museum of its kind in the United States. The exterior is a much-celebrated, early-modern masterpiece by McKim, Mead, and White from 1919. Photo by Mark Baker. Please allow the author to indulge in a little childhood nostalgia. I spent three years here as a kid in the middle house on the city's south side. Photo by Mark Baker. My family roots in the Youngstown area go back several generations. 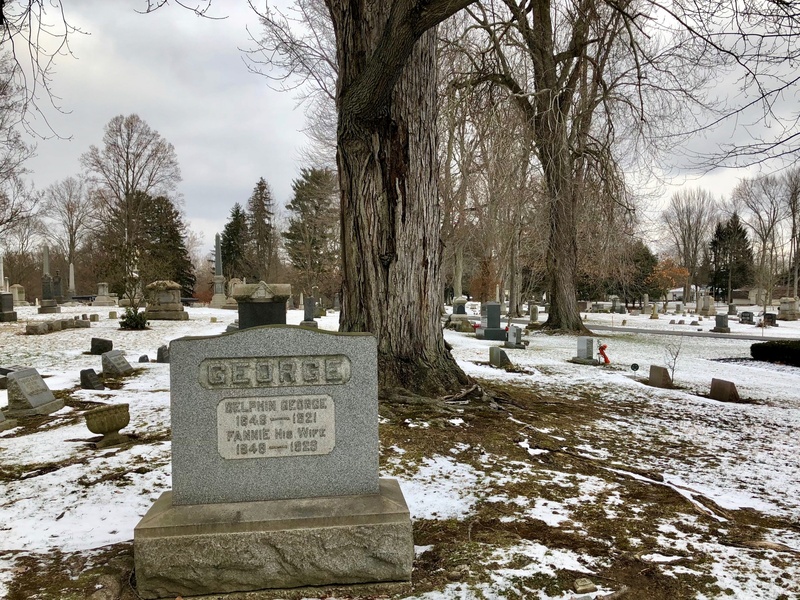 This gravemarker in the old village cemetery of nearby Poland, Ohio, is the final resting place of my great-great-great grandfather and mother, who came to the United States from France in the mid-19th century. Photo by Mark Baker. 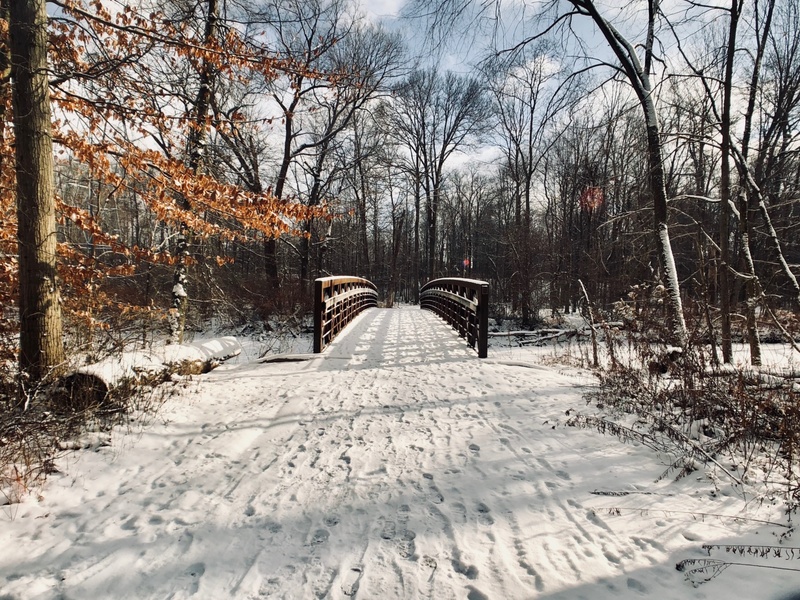 Ironically, perhaps, for a city built on smoggy iron and steel, Youngstown’s main attraction isn’t its industry (or even its museums), but rather one of the largest and prettiest urban park complexes in the United States. Leafy Mill Creek Park follows winding Mill Creek as it snakes its way north for around 10 miles from Boardman Township to the Mahoning River, near downtown Youngstown. Along its journey, the creek cuts its way through gorges and rocks, cascades over falls and spillways, and feeds three recreational lakes. There are miles of hiking and biking trails as well a rose garden, scenic golf courses, and other recreational facilities. I grew up close to the park, and I still know many of those old trails like the back of my hand. The park is home to one of the city’s best-known landmarks, and the cover page of many a Youngstown-area calendar or photo book: Lanterman’s Mill (usually referred to simply as “the Old Mill”). 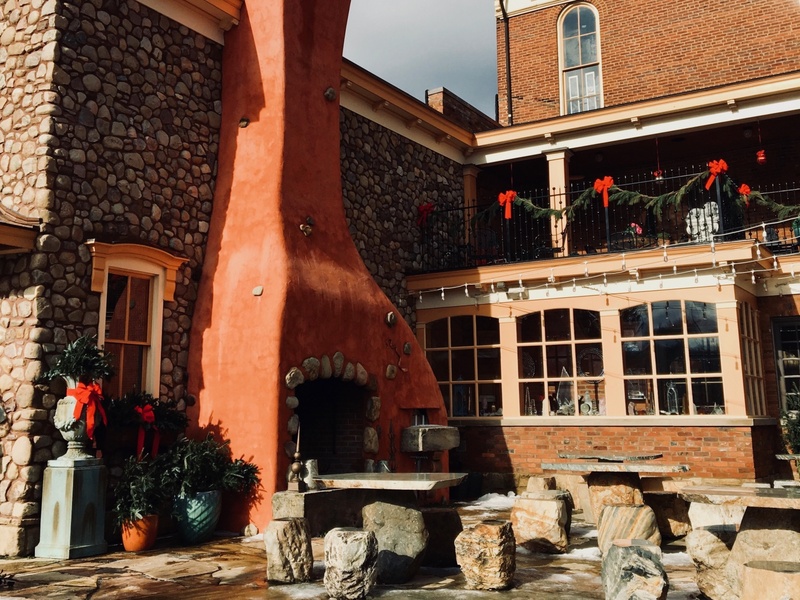 Set alongside one of the creek’s most dramatic waterfalls, the Old Mill looks like the stuff of a Norwegian post-card – and certainly not an image the average person would associate with Youngstown. The mill still grinds wheat and corn into flour, which can be purchased in the gift shop. Spectator sports are big too, and Youngstown has a long and (mostly) successful history of hosting pro sports teams. These include the long-defunct, professional football Youngstown Patricians, who ruled the league that would later become the NFL about a century ago. At press time, though, the number of area professional teams (not counting teams in relatively nearby Cleveland and Pittsburgh) had dwindled to just a couple: the minor-league hockey Youngstown Phantoms and the baseball Mahoning Valley Scrappers. The Phantoms call Covelli Centre home ice, while the Scrappers play their home games in Niles, about 5 miles (8km) north of Youngstown. 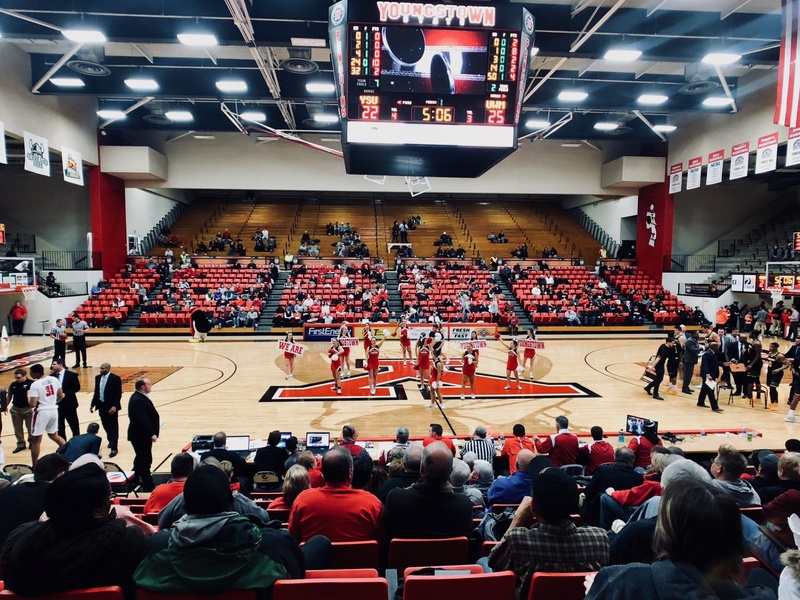 Seeing a Youngstown State football game (in the fall) or basketball game (through the winter) can be a lot of fun. The YSU Penguins football team plays its home games at Stambaugh Stadium, just off the main campus, near downtown. The football team won several national championships at the smaller-college FCS division in the 1990s under coach Jim Tressel (who would later go on to lead Ohio State to a national championship). While the team hasn’t quite returned to those glory days, they do often compete for the national playoffs. The YSU basketball teams, both men's and women's, play their games on campus at the 6,800-seat Beeghly Center. The men's team at least, though, hasn't really been good since I was a kid. High school sports are huge, particularly football played under those Friday night lights. While it pains me to write this, the cream of the crop continues to be my school’s (Boardman High School) arch-rival Cardinal Mooney Cardinals, who perennially compete for the Ohio state championship in their division. Mill Creek Park is filled with hiking and jogging trails, which I still remember fondly from my youth. This arched wooden bridge is near Lake Newport, on the city's south side. 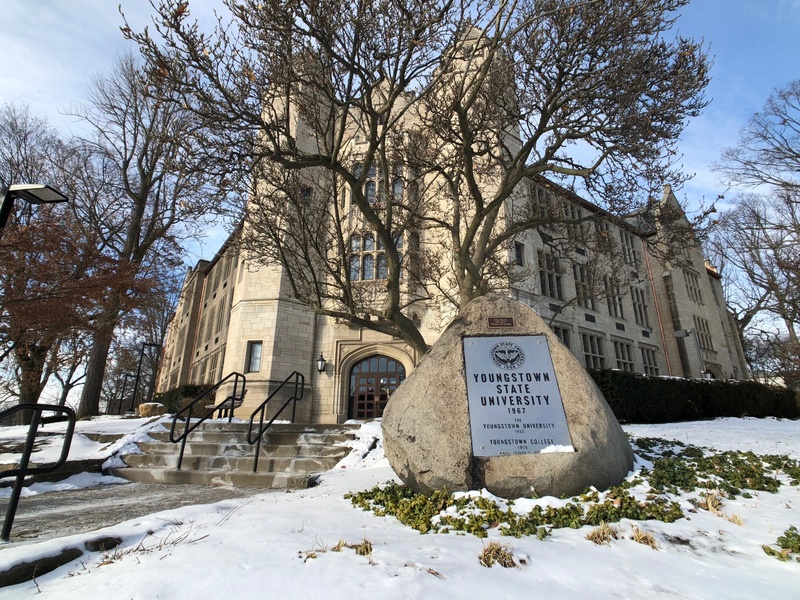 The main building of Youngstown State University, just north of the downtown area. The university enrolls around 16,000 students and is one of the largest four-year colleges in the state. It's a mainstay of the central business district. Photo by Mark Baker. Seeing the hometown Youngstown State Penguins play basketball is a perfect winter weeknight activity. The football team almost always competes for a playoff spot in its division. The basketball team -- not so much. Photo by Mark Baker. 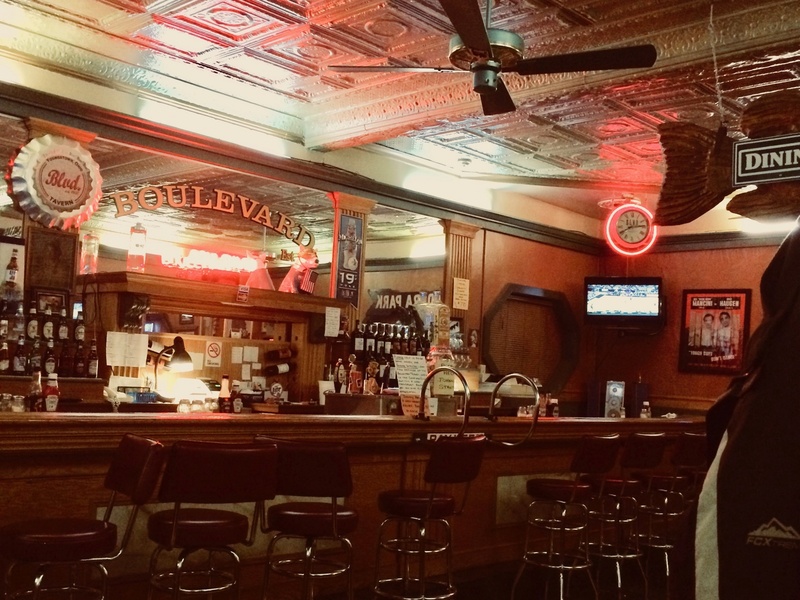 The interior of the legendary Boulevard Tavern, on the city's south side. The original "Boulie" closed down a couple of years ago, but for decades was the go-to place for meatball sandwiches and Friday night fish. I drank here as a high school student -- as generations of Youngstown kids did before me. Photo by Mark Baker. Travel articles, inexplicably, often leave the best for last. After the history and museums are all wrapped up, only then do articles usually circle back to talk about food and drink. With all of the various national groups over the years that have called Youngstown home, including Poles, Slovaks, Czechs, Hungarians, Croats, and Serbs, the city’s culinary heritage is uncommonly rich. Sadly, though, economic decline has taken its toll, too, on the food (at least what you can find in restaurants). The long stretch of pierogi and halušky joints and Greek diners that once ran along South Ave, south out of downtown, are mostly boarded up now. The best places to find Polish and Slovak food these days are at church dinners. That’s not to say there isn’t excellent food around town. Italian cooking remains a regional mainstay. Youngstown has spawned no fewer than half a dozen excellent local pizza chains, with outlets across the city and surrounding suburbs. Look for names like Bellaria, Cornersburg, Uptown, and Wedgewood for some of the best pepperoni-and-green-pepper pizza the state of Ohio has to offer. For something different, try a slice of "Briar Hill" pizza -- an authentic Youngstown creation, featuring thick-crust, a generous dollop of tomato sauce, bell peppers, and a sprinkle of romano cheese (instead of mozzarella) on top. 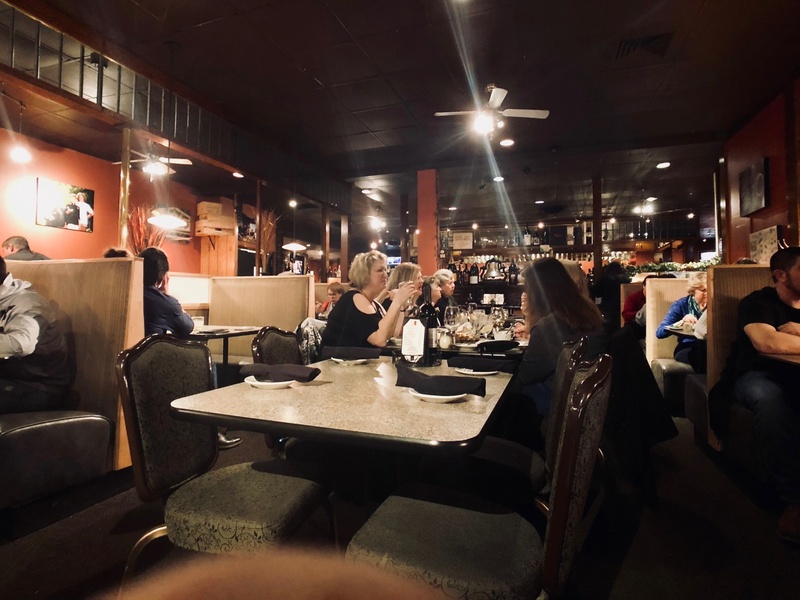 For sit-down meals, in other words a plate of "pasta-and-red-sauce," a bowl of wedding soup (small meatballs and greens in broth), or steaks, chops, and seafood, start off at the MVR downtown or Station Square, north of the city by Interstate 80. One of my favorite new places is in the outlying town of Lisbon, about 20 miles (30 km) south of Youngstown in rural Columbiana County. The Courthouse Inn & Restaurant seemingly breaks all of the Youngstown rules (for one thing, it’s vegetarian) but succeeds anyway. The food, mainly classic Midwestern soups and sandwiches (like tomato with grilled cheese), is excellent. I hope the setting, a restored, 19th-century courthouse, inspires imitators. As far as drink goes, I’ve been out of town so long I’ve lost touch with the bars and clubs – though my much-younger niece and cousin assure me the scene is still happening. The old stretch of working-man's bars on the city’s south side that I remember from my high school and college days, including the old “Boulevard Tavern,” has disappeared, but a new cluster of joints downtown has emerged to take its place. 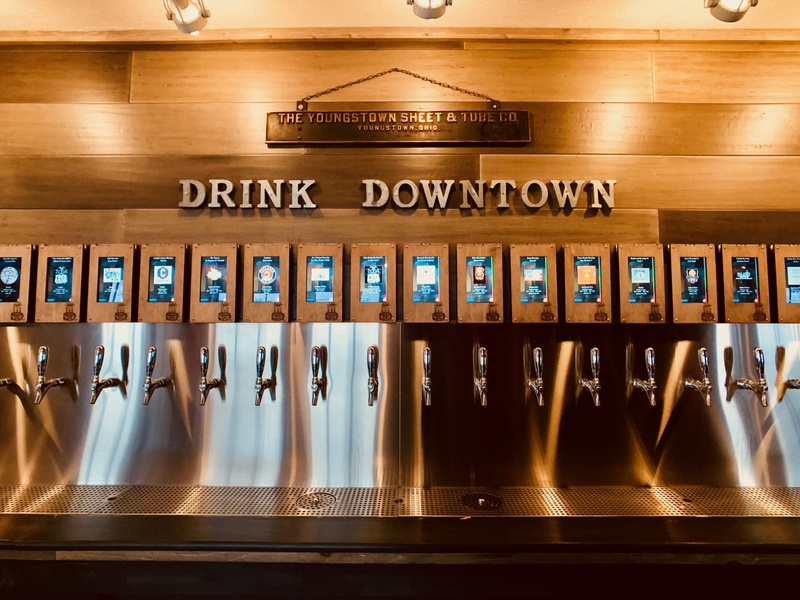 One very promising new place downtown, a craft-beer bar called “Whistle & Keg,” features around 40 beers on tap and light eats. Next time I’m home, that’ll be one of my first stops. There have been lots of books written about Youngstown and its checkered history. One of my favorites is Allan R. May’s “Crimetown U.S.A.: The History of the Mahoning Valley Mafia.” Sean Posey’s Lost Youngstown reads like a nostalgic love letter to the city, though highly worthwhile. Here’s a great Pinterest link to lots of classic Youngstown photos. Check out Metro Monthly for what's on during your visit. 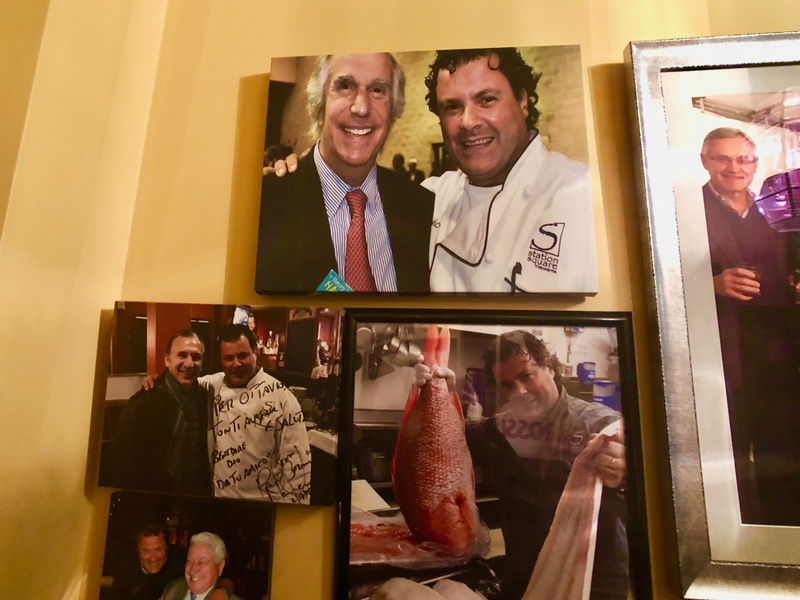 The entryway to the Station Square restaurant is filled with photos of local heroes (though the "Fonz" isn't from Youngstown). The lower left features local boxer Ray "Boom Boom" Mancini. Just sneaking into the upper right is former YSU and Ohio State football coach (and current president of YSU), Jim Tressel. Photo by Mark Baker. The interior of one of the city's most popular restaurants: Station Square, on the city's North Side. Photo by Mark Baker. 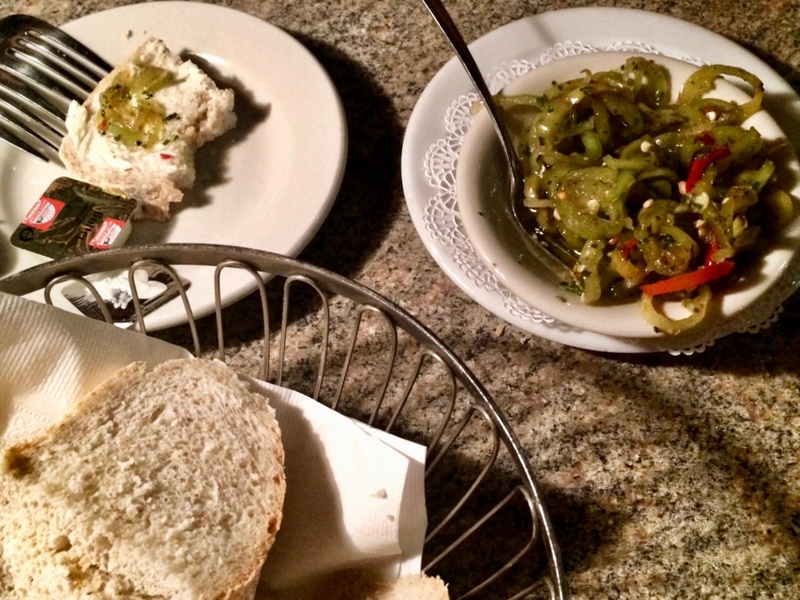 Dinners in Youngstown restaurants often begin with a dish of Italian 'greens' -- in this case spicy peppers cooked in oil and slathered on bread. Photo by Mark Baker. 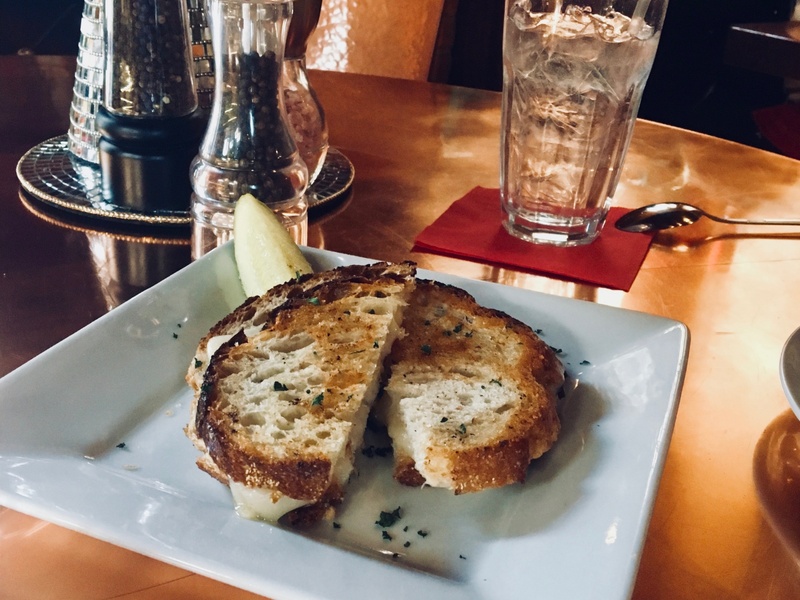 A regional classic -- grilled cheese, served with a pickle -- presented here at The Courthouse Inn & Restaurant in nearby Lisbon, Ohio. Photo by Mark Baker. Downtown Youngstown is crawling with bars these days, including this newish craft-beer joint: "The Whistle & Keg." The interior plays on old steel-town themes and the pub even has a functioning (loud) shift whistle that I can still remember from my childhood. Photo by Mark Baker. This is a great read! I love the perspective of a “hometowner” that’s left for awhile and come back to see the city with fresh eyes. Interesting travelogue on my hometown. Thanks Mark. Worth noting too is that the McKim Meade & White building that houses the Butler Institute is a copy of the Morgan Library building on 36th and Madison in NYC. I used to visit it frequently while I lived on 36th Street and welcomed its familiarity to my hometown museum. Thank you for the comment and interesting observation on the building. I lived for a time in New York City and never realized this. I am sure most people pass by the museum every day and never realize what a remarkable structure it really is. Awesome job Mark. Maybe I will visit Y-town again someday. Seems like another lifetime that I grew up there. Thank you, Keith. I went past your old house while I was home and it is still the nicest one on the block. Thanks Mark, enjoyed reading. I went home last weekend, I entered the park at Volney Rogers and my heart skipped a beat and my bullie cried all the way to Lanterman’s Mill where we parked for our hike. She won’t hike in any other park. Love love love that park. When did you graduate from Boardman? Thanks for a very nice shout out to our home town. I am so glad to see it finally emerging from the economic nightmare that began in the Fall of our Senior year, September 1977. (Locally known as Black Monday, when the steel mills closed and 5,000 people lost their livelihoods). 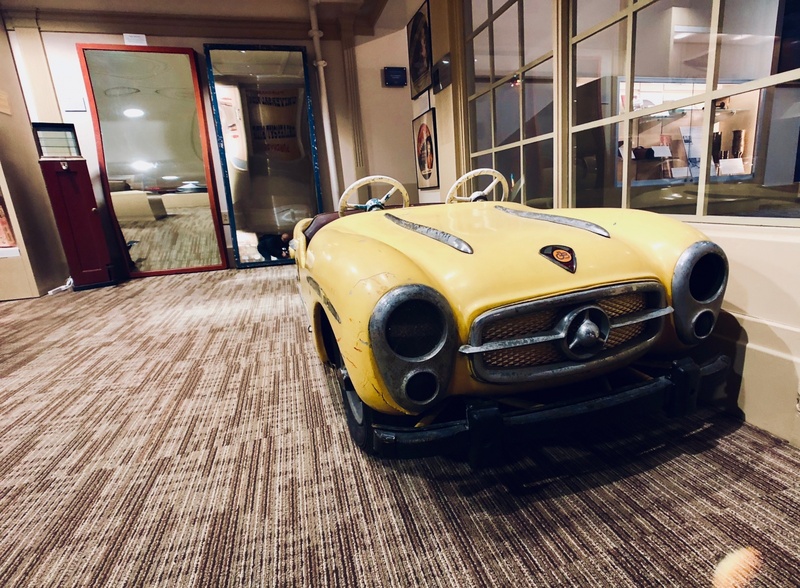 I wanted to add a bit to your mention of the little car from Kiddieland at Idora Park; that car is on loan from a couple in Canfield who have created a private museum of Idora artifacts that they have travelled the world to find! They usually open it twice a year and admission is $5.00. Follow Jim and Toni Amey at Theidoraparkexperience.com. Thanks, Mark! Thanks Mark. Nicely done. A couple of other things I recall was Handel’s home made ice cream that I believe is still there and a very unique but popular pizza place The Elmton. It has been over 15 years since I was in Youngstown. I am going back for our 40th reunion labor day weekend, I hope you can make the trip would love to catch up. Hi Mark, thank you for taking the time to do such a nice write on Youngstown. Enjoyed reading. Wishing you the best. Thanks for taking the time to apply your expert writing skills about Youngstown. I have lived there most of my life and, as you know, we graduated from Boardman together. I did spend some of my life in Cleveland and Cincinnati. I guess you can call me an Ohio girl. One thing I have notice some people say once they move away from Youngstown is that they miss the strong family food traditions. For example, the cookie table at weddings. I was surprised to learn that even places in other cities of Ohio have never heard of a cookie table. Hope to see you at our class reunion. Mark, so nicely written and quite a tribute to our hometown. Of course, I follow you on Instagram. My maternal grandparents were from Bratislava and paternal grandparents from Pohorela so I really love seeing and learning about Prague and Eastern European culture. Sure hope you can make our BHS reunion Labor Day weekend! Thank you Mark. Youngstown is a great place to live. You certainly highlighted many of our best venues. I think there is a Youngstown travel guide in your future. We have more to offer and the public deserves to know. We are counting on you. Loved your pictures too. It was great to see you. Loved the article. Happy to see positive outlook on our great town !! Loved this!! Here are a couple more places. Next time you are back in town you must go to Roberto’s for great Italian. John and I were married there. Great food, great wine. A not miss–The Royal Oaks. Best wings by far and great atmosphere. Let us know when you are back in town and we will meet there! And I will tell Emma to keep you in the loop on the “happenin’ places”. Oh dear, I do reference her in the story 🙂 thanks for reading and leaving a comment! Yes , Italians are the dominant ethnic group in the mahoning valley as evidenced by all the restaurants, traditions and the Italian Fest!! Thoroughly enjoyed reading it, Mark! I hope this year to visit.